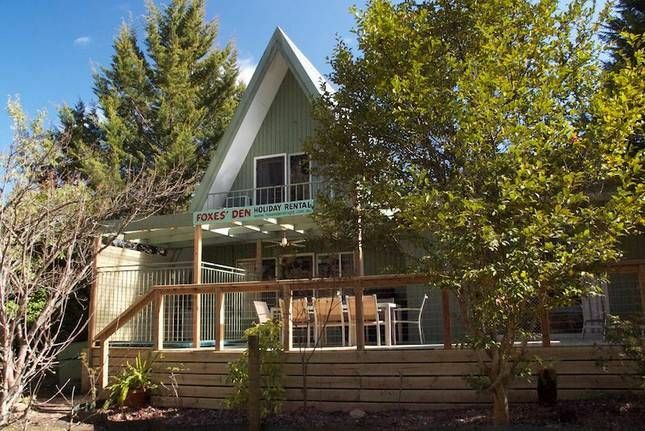 This charming recently renovated Alpine style house is situated in one of Bright's best streets. The house backs directly onto the Ovens River, less than 400m along a quiet riverside track via a bridge into town. Wake up in the morning and enjoy the sound of birds and the babbling river as you eat your breakfast on the large balcony that looks straight down to the river. The house has 4 bedrooms, 2 bathrooms and an open space living area of lounge, kitchen/dining. Perfectly suited for 2 families or 3 couples. Upstairs consists of a bathroom and two bedrooms, one with a queensize bed and private balcony overlooking the river and one with a double bed with a single bunk on top. Downstairs you will find 2 bedrooms, one with a single bunk bed and the other with a queen size bed and direct access to the large balcony and views of the river. There is also a fold out sofa bed in the lounge for the bigger groups. On the rear deck there is an heated outdoor 8 person spa which is an OPTIONAL extra charged at $140 per stay. Please note that we do have a 4 guest minimum for the weekends and school holiday periods. Friends and myself totally enjoyed our stay. Nice short walk to all amenities and backed onto the ovens. We enjoyed our stay very much. Everything you need is there. Walking distance to all the restaurants. Perfect place. We enjoyed our stay comfortably as a group of 7 adults. Beautiful spacious rooms! We look forward to staying again in the future. We all had a lovely & relaxing stay. We’ll be going there again. Wonderful stay with the family a great location and well equipped house. We had three nights at Foxes Den with our Large family.Our adult children loved the proximity to mountain bike tracks and town.The house is great for large groups like us and we had everything we needed.We are all talking about booking again next year.Thankyou Wendy it was fabulous.